A thematic rap triumph from the hip hop superhero team of Czarface – already a veritable supergroup featuring Boston underground veterans 7L & Esoteric with the Wu Tang's Inspectah Deck – bringing in Wu MVP Ghostface Killah for the unsurprisingly massive Czarface Meets Ghostface! 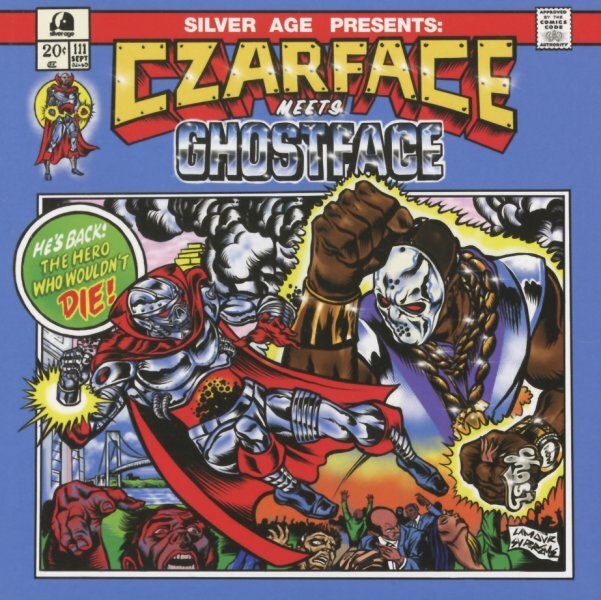 One of the standout facets of the Czarface project since the beginning is they way 7L, Esoteric and Inspectah Deck roll with the comic book hero theme without overdoing it in a way that pushes the thematic vibe into gimmickry – major props to 7L for laying down fuzzy funk beats and comic book action in a way that's action-packed larger than life, yet succinct and on target – and doesn't hurt bring in some of the best rappers in the game on each successive effort. Includes "Back At Ringside", "Face Off", "Iron Claw", "Czarcade '87", "Powers & Stuff", "Masked Superstars", "The King Heard Voices", "Listen To The Color", "Mongolian Beef" and "(Post Credits Scene)". © 1996-2019, Dusty Groove, Inc.